I originally wrote this article as a handout for reenactors specializing in pre-1600 personas. It focuses on the time frame of the Middle Ages and is intended as a brief reference for aiding in persona development and costuming. In cultures where religious behavior is an important part of your participation in the society, understanding what sort of religious equipment your persona would have owned, displayed, and used is an important part of developing and dressing your persona. I have since written a much more detailed book “Prayer Beads for My Persona – Part 1: Christianity”, but this article remains a good basic resource. Prayer Beads have been used through the centuries by most major religions. The use of counting devices seems to appear whenever a religion decides to use the repetition of prayers as part of their rites. Prayer beads simplify the process of counting and remembering prayers, and they have the advantage of being portable. 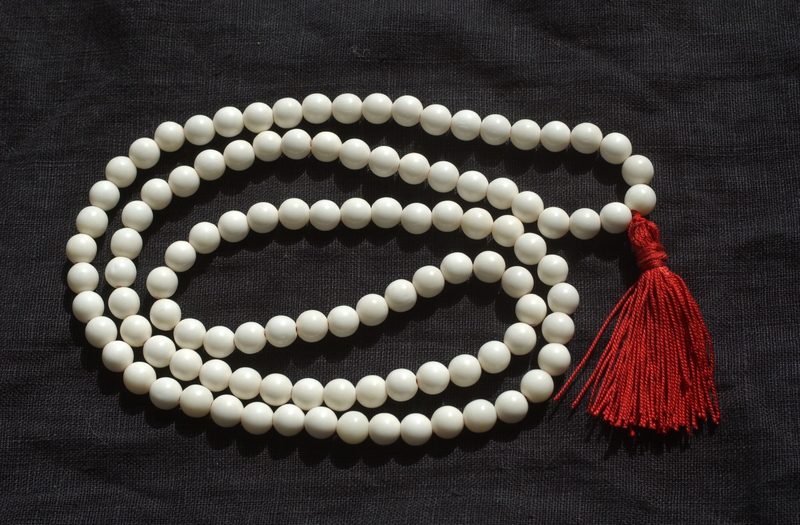 Hindus may have been the first major religion to use prayer beads, known as mala, as early as 8BC. Modernly there are two major branches of Hinduism, Shaivism and Vishnuism. Shaivists, who are devotees of the god Siva, carry strings of 32 to 108 beads, made from the seeds of a specific plant. Vishnu mala usually have 108 carved wooden beads made from the sacred basil shrub. Buddhist prayer beads are also called mala, and usually consist of strands of 108 beads, one for each of the impurities or lies that one must overcome in order to achieve Nirvana. The long malas are usually only worn by monks, ordinary people usually wear only 30 or 40 beads. The beads were originally made from the wood or seeds of the sacred Bodhi tree, but as Buddhism spread throughout Tibet, China, Korea and Japan, new materials such as bone, amber and semi-precious stones became common. The Catholic Church used Paternosters, modernly called a Rosary. The name comes from the “our Father” portion of the prayer. The Paternoster appears to have existed since at least 1000 AD, but specialized versions may date much earlier. The basic unit of the modern Paternoster is the decade – 10 smaller Ave beads and one larger Paternoster bead. Variations of 5 and 7 beads are also known. 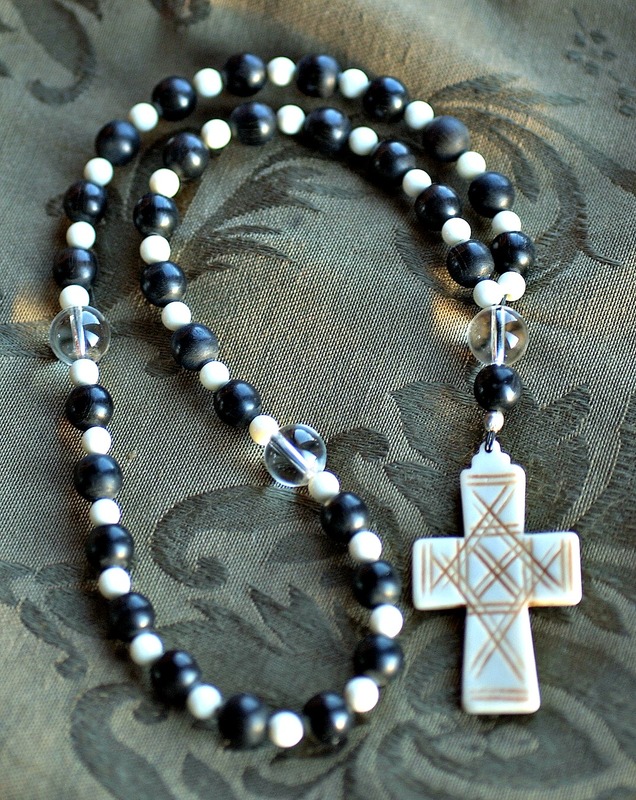 Some religious orders had specialized forms of paternosters with specific special beads to represent special prayers. Ave Maria, gratia plena. Dominus tecum. Benedicta tu in mulieribus, et benedictus fructus ventris tui Jesus.Sancta Maria, Mater Dei, ora pro nobis peccatoribus, nunc et in hora mortis nostrae. Amen. Sumptuary Laws, prohibiting the ostentatious display of wealth appeared in Europe as early as the 1200’s. An elegant solution to this challenge was the “Paternoster”. The Paternoster beads were made of a wide variety of materials including: coral, amber, jet, crystal, chalcedony, lapis, silver, blue glass, wood, tin, shell, bone, and horn. The Mary Rose shipwreck, which occurred in July of 1545, provides us with at least 8 Paternosters. The materials used to make the Paternosters were often believed to have magical properties, adding to the “magic” of the Paternoster. As a side note – Ave Maria Gratia Plena was used as a protective incantation during the Middle Ages. The initials – AMGP were frequently engraved or stamped on jewelry, and other items, as a source of added protection. The two most common forms of Paternosters in Europe are the Tenner and the Three Decade. The Tenner (called the Zehner in German speaking areas) is a simple strand of 10 Aves with a Paternoster (sometimes called a Gaud), a tassel, or a cross at the end, and sometimes a ring for suspension, or a tassel at the other end. The Three Decade Paternoster is simply three groups of 10 Ave beads separated by Paternoster beads. The early Paternosters usually ended with a tassel. Later versions sometimes ended with a cross. Crucifixes were rare on Paternosters until after 1600. The materials that Paternosters were made from varied greatly by social class. 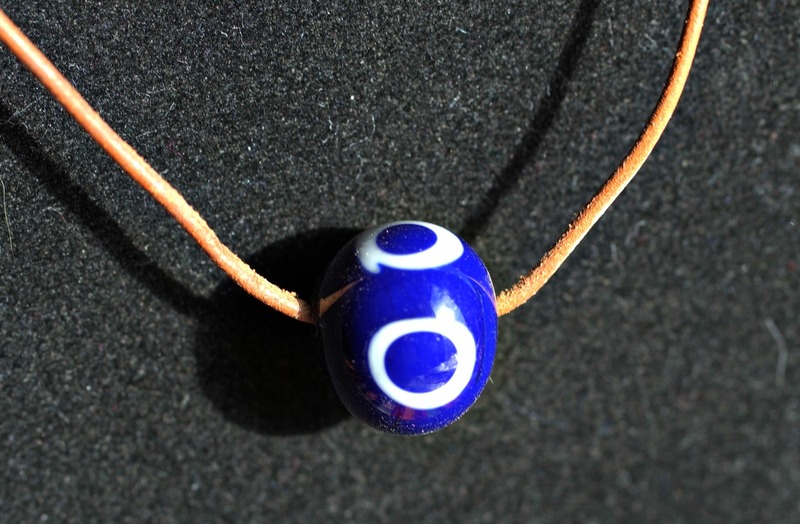 Islam – Men, women and children frequently wore talismans, such as the eye bead, to protect them from the evil eye. The “job” of praying was largely assigned to men, and therefore women rarely had prayer beads. Here is an example of a simple eye bead necklace. 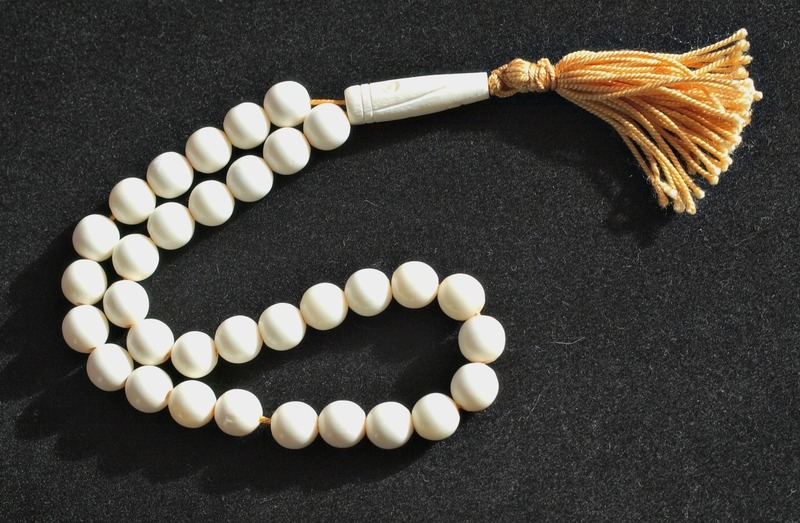 There are two predominant forms of prayer beads used in Islam, The Subha and the Tesbih. The Subha was a string of either 39 or 99 prayer beads which are used to enumerate the 99 names or attributes of God. The strand of 99 beads is usually divided in thirds by a slightly larger bead and includes an elongated terminal bead. 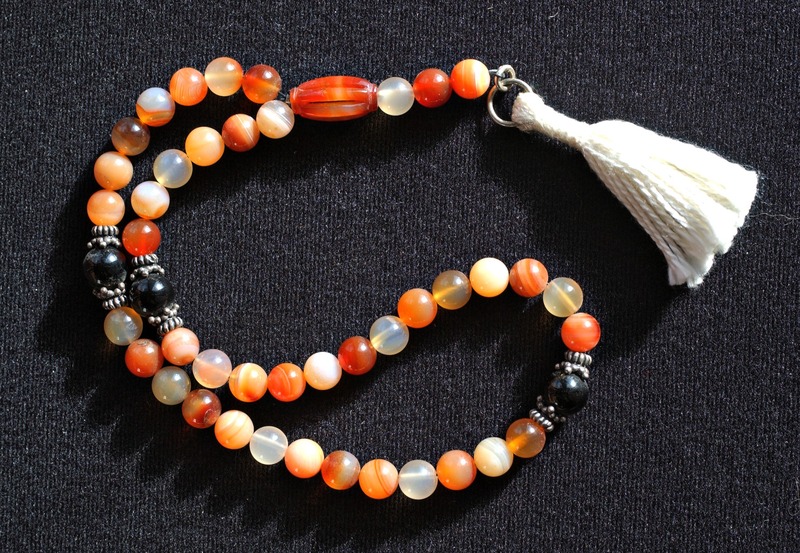 This form of prayer beads was used predominantly in North Africa and the Arabian Peninsula. The Tesbih is a strand of 33 beads, usually adorned with an elongated bead and a tassel. This form of prayer bead strand was used predominantly in Persia and Turkey. Here is an example of a nicer than average (a little fancy) Subha. And here is an example of a typical Tespih. I hope that this brief summary of Prayer Beads used during the Middle Ages is helpful to you in your development of a more historically accurate portrayal of your persona. This entry was posted in Prayer Beads by Eirny. Bookmark the permalink.